I'm a fan of the mobile game, and still play the Japanese version after Scumi shut down the English server. The story in-game was more generic and unmemorable. But this movie was different. The story takes a different route where the Hero doesn't defeat the Dark Overlord and instead gets cancer and PTSD. It was an interesting and darker twist; and definitely has more potential than the story that the game had. The animation was stellar. It's no surprise the anime had an overload of characters, but the designs of them all were great. Most side characters have one or two quirks, but the main ones like Yuri and Amat get quite a bit of development even though Yuri was just the self insert in the game. The Sages stood out to me the most; they're the crazy and over the top ones. It was more than I expected from a card collecting game. I really enjoyed the show and the producers did a smart move to change up the story to get old and new fans interested. If you like the RPG genre, then this is an anime you should watch. It's definitely not 'tropey' or 'generic'. This has potential and I'm looking forward to more. This review will contain spoilers. You have been warned. 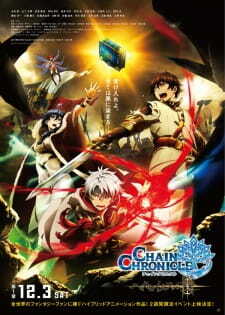 Chain Chronicles was a game before it was adapted into anime/movie format. I have not played the game, so I have no past connection nor nostalgia with it. Every bit of this review is based on the anime. The story began with a twist; the hero, Yuri, lost against the Black King in the Imperial Capital. Not a lot of anime show what would be the “climax” of a story, where the hero and Alliance fought against the antagonist, and lost. I was intrigued by the setting and kept watching to see how it would develop. However, the story became more predictable as it went on. Though this may be because it was quite evident that the world was falling into chaos due to the Alliance’s defeat at the Imperial capital. There were riots in the Holy Capital and the Holy King’s position was split between three people. Unfortunately, it was a minor focus. Yuri ventured to meet the 3 Sages, which is sad as they barely had any screen time, as they were quite alluring characters. There are two side-stories in this. Yuri’s PTSD-like illness and Burckhardt’s fall into darkness. Due to their defeat, Yuri suffered greatly. He had lost hope and had hallucinations. He was struggling with himself internally and couldn’t fight until he saw Aram, whilst he fought for the safety of a village. Yuri regained his hope and will to fight after a short period only. I wished that they had explored more of his mental illness and see how bad it affects people with it. To me, it was quite unrealistic as Yuri suddenly gained hope just from one person, Aram. He had suffered a major defeat at the hands of the Black King, and now he’s back in it to win it. Had they spent more time with Yuri not being able to fight and slowly win over his PTSD, I would have enjoyed it more. Nonetheless, he was still struggling with it even after he regained hope. Burckhardt fell into despair as Aram, a mere kid, had single-handedly fought many enemies on his own. Aram stole his mana, not once but twice, which pissed off Burckhardt. Aram then called it “even” when he gave back Burckhardt’s with his mana resupplied by the former. Combine this hatred with the fact that he speculated that Aram had stolen a sword, and lost the ensuing argument made him fall deeper and deeper into seclusion. On top of this, the Princess had him accompany the Volunteer Army (VA), an army which Yuri and Aram are part of. He had no chemistry with them, yet, the princess still had him go with them. The Princess’ reason being that she wanted Burckhardt to understand Aram. The saying “opposites attract” does not work here, instead, it worsened the relationship between Burckhardt and the Volunteer Army. In the end, he had succumbed to darkness and became a demon, which the VA fought for a while before Burckhardt left. This must have taken a toll on the VA, both physically and mentally. Had they focused more time on his mental state and his hatred, they would have nailed this storyline very well. The 2D animation quality was amazing and consistent when used. Although they used 3D animation during some battle scenes, which flowed somewhat well. Though personally, I still prefer 2D animation over 3D. The sound effects for this was quite astonishing. From the magic, to swords clashing, it was quite enjoyable to hear it. The music was on par too. No major complaints here other than just maybe having more hype music. The cast was huge. So many characters squeezed in. Great character designs separated them nicely. However, there was not much focus on character development, plus with such a character roster, it was hard to develop all of them finely. I enjoyed the interesting premise. Burckhardt’s story was interesting and I wished they had focused on it more. Yuri having PTSD-like symptoms was also great. However, they had failed to fully execute Yuri’s side-story as he regained hope in no time at all. The whole thing felt like it was rushed in pacing. Had they given time to explore the dark undertones, it may have been better. Medieval adventure is one of my favorite genres of anime. Not just anime, actually; also movies, books, etc... So, Chain Chronicle was very fun to watch because of it, but it has some problems that kind of messed up my immersion in the world that's presented. The main problem was the story. It's about a group of people that, in order to restore peace and save the world, go fight a dark army that has taken command of the world. Even though it's ordinary, it ain't bad. The main problem there is the story telling. It's like if the story begins in the half of it and they don't show the real beginning. You just don't understand what happened in the past and how has this dark army taken command, and, so, you feel lost in the story. I didn't play the games, so i don't know, but it's a problem that can easily be fixed in the next movies, so let's hope they fix it! The art is great. It is really well designed and they present to us a fluid animation in the fight scenes and in all the other aspects. So, it fulfill the criteria. The sound is also good, but it isn't outstanding. Actually, i just finished this movie and i don't remember any tracks from the OST. But there wasn't a single part of the anime that i felt like something about the sound was missing. Another major problem is the character development, but it's more of a consequence of the problems in the story than a problem itself. Well, you just can't like a character judging only the appearence, the style and the personality of it. The main thing is the background of the character, at least for me. And if the story begins in the half of it, you don't know the background, you don't know who are the characters and how did they get where they are. Then i didn't care about what happened to them. But again, it's also a problem that can easily be fixed in the next movies. Let's hope for it. So, Chain Chronicle is a good anime with some problems, but people that like medieval adventure will probably enjoy it, generally speaking.